And in between is … well, not much, frankly. But that’s what makes the DJM-250K2 interesting – it’s got the high-end features you want, stripped of the stuff you probably don’t need, at a very aggressive price. (It’s US$349 in the USA or €349 including VAT in Europe.) That makes for a departure even for Pioneer, let alone the market. The MK2 gives you basically what you liked best about the old DJM-250 — the price — and adds some high-end features. First, there’s a nicer crossfader, the Magvel crossfader borrowed from the flagship Pioneer DJM-900NX2. Then, there’s the “Sound Color FX” filter, also from the 900NX2. Plus, you get full-kill three-band isolator EQs, also from the high end of the range (so you can cut a band by turning all the way to the left). And then there’s the main addition, a built-in sound card with USB. This is why I think this could be handy for live use – it means you get instant input and output and easy recording. But it’s also there to serve the Pioneer ecosystem, so you might use it with Rekordbox to play music directly from your computer (look out, Traktor and Serato), or to turn the whole rig into a digital vinyl (DVS) system. 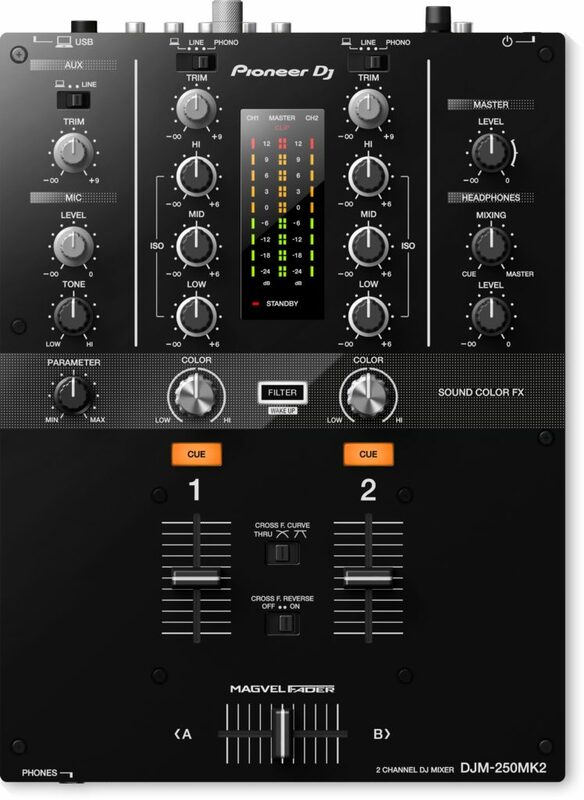 There’s even a full DVS license in there, which at full retail standalone costs almost as much as this entire mixer. We live in the software-hardware bundle age. So, this is pretty cool. You get a basic-but-premium mixer with XLR and phono/cinch I/O, for connecting decks or CDJs or turntables or whatever, plus computer connectivity, plus necessary Pioneer software, and eminently playable filters and EQs. I also have to wonder why the computer vendors don’t offer something similar. Even if you’re a Traktor die-hard, for instance, you could easily integrate this into your setup, and it isn’t expensive. So Pioneer continue to be really aggressively spreading through the market, and their size are allowing them to get price competitive in a way that’s going to be tough to match. The logical head to head competition here : look to Allen & Heath with the Xone 23, or Mixars, with similar specs. Now, I still think there’s room for mid-range (or say “high-end entry level”) DJ mixers, especially as to my knowledge no one makes a really good analog one — just do something like this with a good mix architecture, a nice crossfader, and some reasonable analog EQ and filters, minus the computer sound card business. But let’s see if anyone takes up that call.